Jorain Hardman, a resident at Swayze Court Apartments, stands with Communities First, Inc. 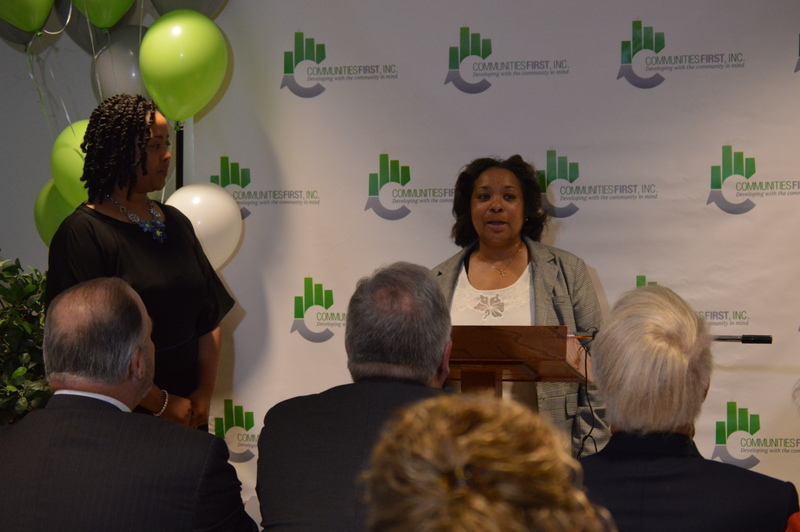 Co-founder Essence Wilson as they address guests at a March 31, 2017 ribbon cutting ceremony introducing the recently rehabbed apartment building to the public. FLINT, MI – Jorain Hardman needed a new start. She had overcome a number of obstacles including a drug addiction and was ready to get her life on track. Hardman is one of a number of residents who no w have affordable living and a better quality of life thanks to an $8.3-million project by Flint-based Communities First, Inc. to rehab Swayze Court Apartments, as told to Flintside.com. Through Communities First’s efforts residents at Swayze Court have a number of amenities including a computer lab, job and education resources and access to various community programs. Since she became a resident at Swayze Court Hardman has completed a nutrition program, is working on a gardening program certification to be part of an effort to bring fresh produce to residents and is now studying for her GED. Unlike other housing developments Communities First’s founders Glenn and Essence Wilson say they want to help people in Flint gain opportunities through economic development, affordable housing and community education. The husband and wife team launched Communities First in 2010. Since then, they have completed two multi-million projects including Swayze Court for an under served community in Flint. In 2014 Communities First rehabbed Oak School into a 24-unit low-income senior housing facility. It opened September 2015. Swazye Court has been a part of the Flint community since 1924 and was once home to a number General Motors executives and other Flint professionals. During the last 15 years the building had deteriorated due to neglect, abandonment and vandalism leaving an empty eyesore in Flint’s Grand Traverse District Neighborhood. The renovated building and newly constructed building on the site provides 36 affordable apartment units for mostly low-income families. Swayze Court Apartments is a collaborative effort between Communities First, Inc., RAD Conversion Specialists, Michigan State Housing Development Authority, U.S. Department of Housing and Urban Development, City of Flint, Genesee County Land Bank Authority, Chase Bank, National Equity Fund and Michigan LISC. The Wilsons introduced the project to the community during a March 31, 2017 ribbon cutting ceremony where guest toured the newly rehabbed Swazye Court Apartments. Guest also included Congressman Dan Kildee, Calley, Executive Director of Michigan State Housing Development Authority Earl Poleski, Sentaor Jim Ananich, Steve Branch who serves as City of Flint Chief of Staff, and Associate Director for Corporation for Supportive Housing John Peterson. For more information on Communities First Inc. visit their website by clicking here.